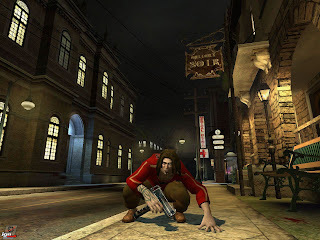 A few friends asked for recommendations on solid, plot-based, RPG's (for the Xbox 360, PS3, or very crappy PC), that don't require a pointless level grind. With this in mind I'd like to present you with a list of the best RPG's I've ever played. Yes, it's a fairly lengthy list but you'd probably rather spend 5 minutes reading about a game than invest hours and money on the back end. This list is entirely SPOILER FREE so you can read it and not have to worry about me ruining anything beyond how generally awesome these games are. There is a reason that the entire title is in bold. This is easily one of the best Sci Fi series ever seen or experienced. It has as much depth as the Star Wars Extended Universe and is only a mere 3 games long, compared to the 100's of books and dozens of video games in the SW Galaxy! What's more, it's made by the same people who did Baulder's Gate (sort of) so each save carries over from one game to the next, bringing with it the weight your prior decisions, and you can get the entire series in a bundle for around $30 which is a total steal! 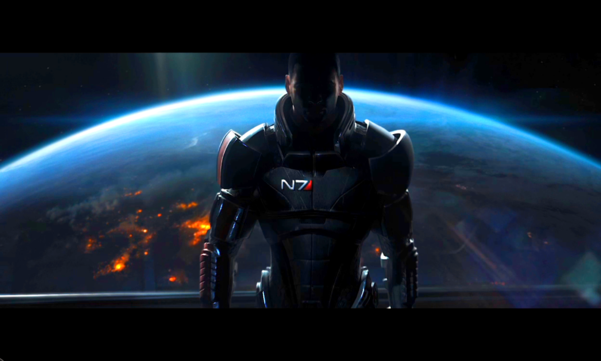 Just how open ended is MASS EFFECT? Why is this series great? No level grind. Tight main story. Lots of decisions that will affect the rest of the SERIES! That's right, if you capture the obscure side-quest bounty dead or alive in the beginning of the first game, that decision will carry over through the rest of the series! You might change his life and he might create a mercenary group dedicated to slaver prevention (he himself was enslaved as a kid) and help you out in the second game, or reappear in the third game to repay the favor of saving his life. Alternatively, he might be in a prison in the second game still, or escape and try to murder you based on other decisions you make. He can also just die because you killed him... Note: This specific scenario is purely hypothetical and not in the game so I can avoid spoiling anything. It's the 1000's of little things like that which make the entire series remarkable. Also, next gen graphics, great music, and a great story line don't hurt either. The plot is so fantastic in my mind that I'm even writing two songs about powerful moments in the second game! I can't really reveal the story without spoiling the game for you beyond: Galaxy In Danger! Go save it! 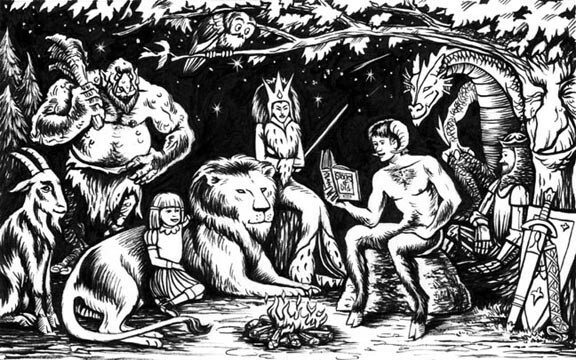 but it's strengths lie within being a storytelling game with strong companion interaction elements. Lastly, it's an action RPG so don't expect any of that turn-based stuff. If you like sci-fi at all do yourself a favor and buy this game. You'll be hard pressed to regret it. A fantasy game with the same makers as MASS EFFECT (more or less). It plays like KOTOR (which i'm omitting from this list because I'm assuming that you've already played and beat them) or other real time RPG's but is actually just turn based just posing as real time. It's also very open ended. Seriously. You can be evil, good, or shades of grey and your decisions carry out through the rest of the game and subsequent expansions. Really. This game is all about the shades of grey and having to make really tough decisions you'll need to live with where there is generally no truly "good" decision. MASS EFFECT does this a lot, but I feel like Dragon Age was better at having decisions with no good outcome. Some of the 'lessor of two evils' scenarios are tough to work out in your head and I've found myself trying to do good or evil only to realize that I've done the opposite of what I intended because I didn't think far enough ahead (there are instances where the equivalent of a holocaust is actually considered kind of a good thing because of extreme circumstances and the whole "best good for most" principle). "Well, sh*t! There goes the fruit harvest"
Dragon Age: Origins is fairly old and retails for ~$15-$20. I can't stress enough that if you like fantasy at all that this game is completely worth your time (though you can skip the sequel entirely)! 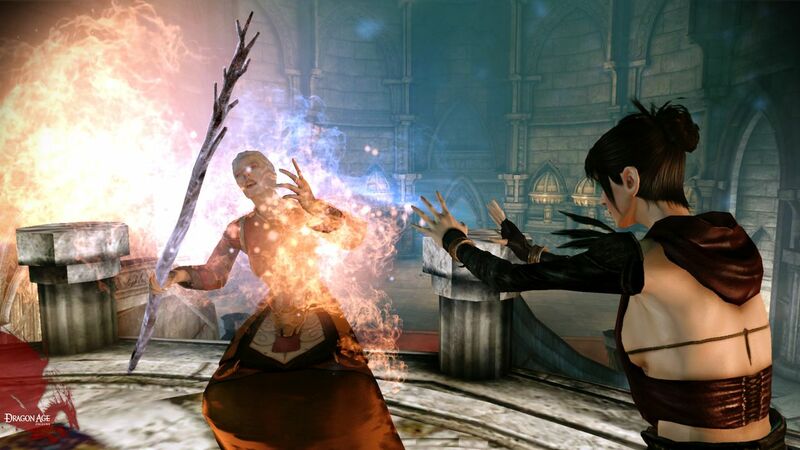 Oh, and as a word of the wise mages are awesome in this game. You should probably play one of those and never play a 2 handed-weapon wielding warrior, because they're just not fun to play. No one I know who chose 2 handed weapon warrior said to themselves "Wow, what an excellent choice of class I've made," because it's not that good. One last thing I forgot to mention... The first hour or three of the game is completely different based on the class/race you've picked. So an extremely high replay value! Here's to hoping Dragon Age: Inquisition (3) lives up to this gem. 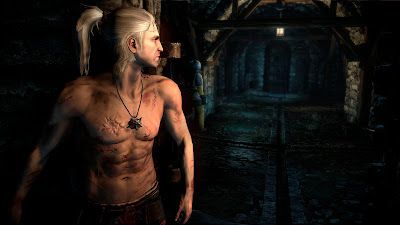 While the above games are "collaborative epic fantasy/sci-fi" where you walk around with a team of dear companions, the Witcher is about one amazing monster hunting badass going solo to save the world from great evils. This is the game that influenced a lot of how I (and by proxy my band) look at what monster hunting should be like... (Castlevania being the other major influence). The main character is amazing (depending on how you play the game), diverse (depending on how you play the game), and dark (no matter how you play the game). Another HUGELY open ended experience where you can randomly declare someone is a witch and have them executed just for looking at you funny. 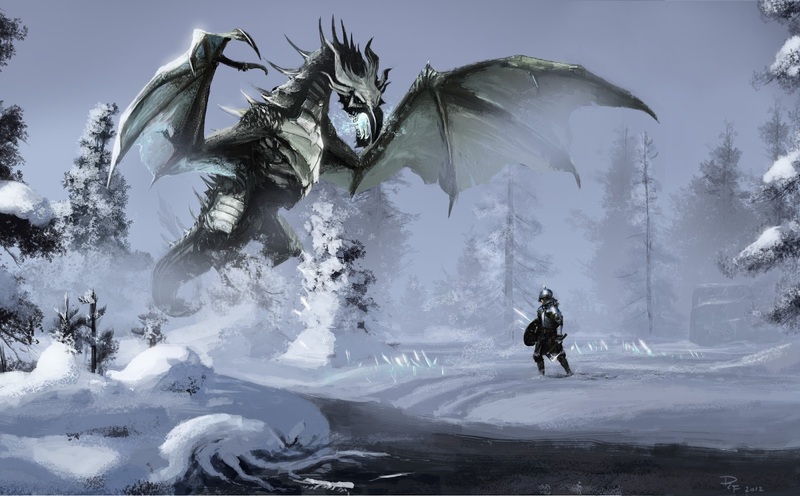 There are lots of dialogue options and you can either lone wolf the game something akin to a Germanic monster hunting loner, or socialize it up and have every maiden in the land swooning over you (and more if that's your thing). The Witcher is much like an old German Grimm fairly tale in feel (in all the awesome ways), and was the great monster hunting epic I was waiting for! 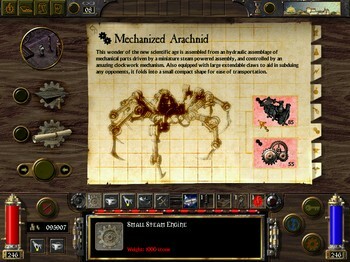 I know i'm being redundant but it even references things like Koschei (an ancient spider for some reason) and has a super-detailed alchemy system that would give Professor Snape a run for his money! Like the above, no level grind. 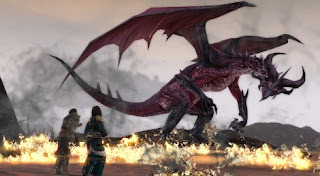 One thing that separates this series completely from other games is the combat system which is timing based and involves swapping weapons based on what you're fighting (silver for magical creatures, steel for mortals, etc), switching fighting styles, stances, etc... The combat system has a place in my heart because it reminds me of all the German Long sword training I know and is again "Timing Based", where you need to click the attack button at the right times to make the best use of your enemies' openings! My only complaint is the loading times on my crappy computer, but that's probably my fault. I really can't wait to see what Witcher 3 looks like! and Elder Scrolls V: Skyrim! Where Elder Scrolls III: Morrowind was a completely open ended world you could do ANYTHING you wanted, it was really hard to find out where you were going, where the next quest was, and often times you'd accidentally kill someone important to one of the game's faction quests (the thieves guild, fighter's guild, mage's guild, and others have you kill important members of rival factions). 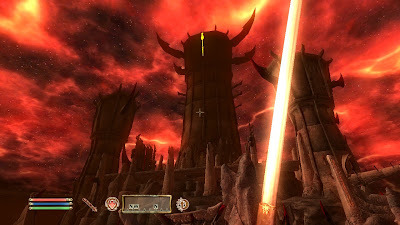 Oblivion and Skyrim make the series playable to the more casual gamer and are basically a giant open world with a rich plot, super rich back story to the world (lengthy books are available within the game similar to MASS EFFECT and Dragon Age), and a world you can actually explore and find things that your friends may have never come across. It's pretty dapper like that. For instance, Helios told me a rumor about a cave in the center of an island where the vampires dwell. 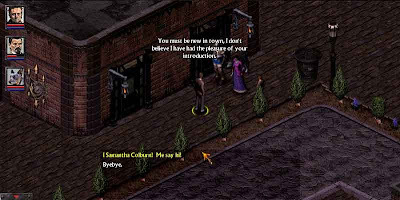 Having never seen them I follow his verbal landmarks and found the creepy-as-hell guild hideout and was admitted (to their guild) on the spot for finding their secret base, which had been hinted at in various books throughout the game and by certain characters who would talk about vampires. These games have a good story but it's not really the central focus somehow, so don't think of them as being story-driven, though it's certainly rich in story. You'll know what I mean when you play it. Storming the very gates of Oblivion! The focus of the game is mostly exploring a great world and becoming whatever you want. By the way: Always make your own custom class! Just trust me on this. If you want to murder people and steal their loot you can. If you want to be the best wizard ever they have a story arc built into it for that. If you want to save the world from the armies of Oblivion (a kind of hell), you can become a crusader and do so. If you want to be the king of insanity... well, you get the picture. The main plot is oddly optional (once you beat it, the game continues on like nothing happened) and, get ready for it... the game levels up with you, and you only level up skills that you use, which makes for a really neat character creation/leveling system. You should be aware that the games feature strict real time combat and, once again, it has a HUGE back-story for the series that ties all the way into the original Elder Scrolls (an ancient PC game that's for the less casual gaming crowd). So what's the difference between the two games? 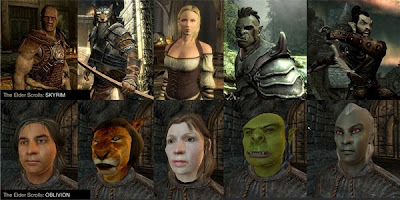 Oblivion: Traditional fantasy setting, older than Skyrim (worse graphics), nice story, nice guilds, but probably is neigh unplayable if you've played Skyrim because Skyrim is so much more pretty (unless you get it for PC and install the various beautification mods that enhance the graphics, which will take you a few hours). Also, no real dialogue options, just a sort of linear "here's the story, go affect the world in any way you'd like." It's well written and you've got many ways to accomplish a given task, including an extensively customized magic/item creation system, so in spite of a linear plot you will still feel like you're in control for the most part, you just might not care as much. Oh, I should also mention that quests within each guild get progressively more and more awesome and don't kill your chances of joining another guild. You can beat the entire game 100% in one play through. Stick with each guild quest chain if you start one because they get fantastic! Lastly, try to get the "Ultimate Edition" or anything that says "Includes Shimmering Isles Expansion." You'll thank yourself later. Both games are well written, just expect to follow a predestined story as opposed to controlling the story (aka, it's just like any rpg prior to 1999 or the entire critically acclaimed Final Fantasy series). 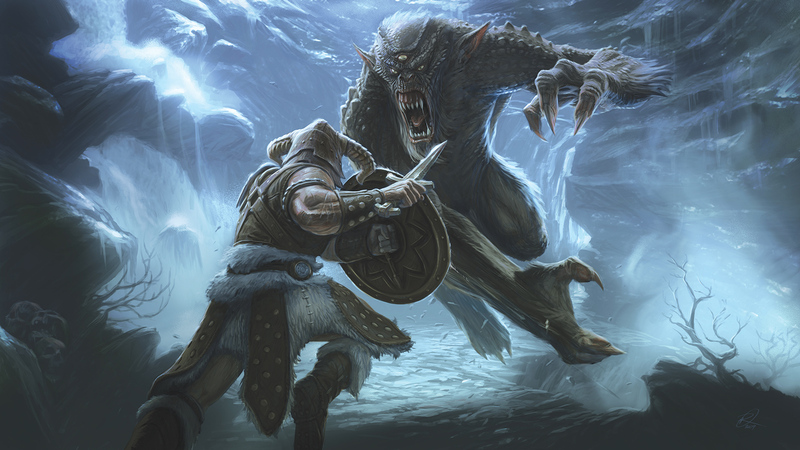 Comical aside: Even corporate rivals like Square-Enix and EA have admitted in press conferences that Bethesda's Skyrim is pretty much the gold standard of current gen RPG's and readily admit that it's the RPG by which all other RPG's will be judged. V.A.T.S. can't save you from a mutated bear! 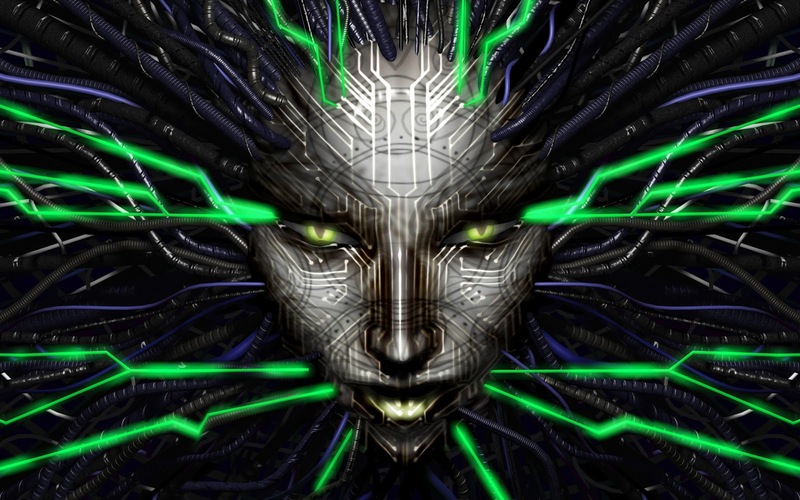 This is the original story driven open-ended game for your home computer. It's awesome. 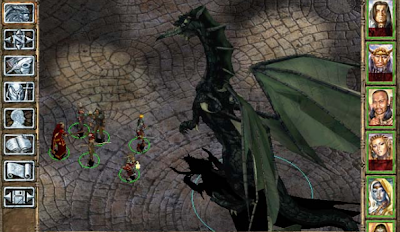 It looks like Diablo 2 (isometric top/down view), doesn't have leveling/grinding requirements, and 90% of the time combat, even the 2nd to last boss fight, can be completely avoided. 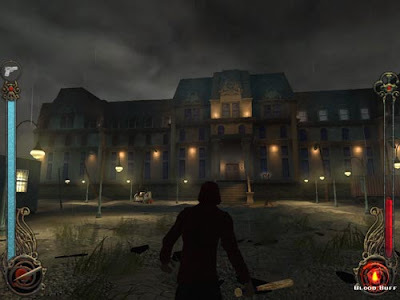 It can be turn based or an action-rpg with the click of a button in "options," it's got some nice voice acting, and is incredibly open ended... and dark... Did I mention that it's really sinister and dark? Entire cities enslaved through drugs. It contains prostitution, slavers, and child labor! You can become a washed out boxer turned junkie if you play your cards wrong. Fallout has a really weird world with a very Mad Max feel to it (same fallout world as seen above, only much darker). 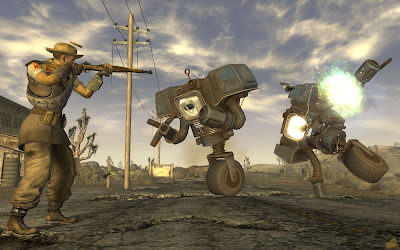 I personally preferred this game to Fallout 3 because there's a lot more dialogue and combat felt more optional which fit my character build, unlike in Fallout 3 where you need a combat specialty to be effective. Lots of references to things you love. Oh, you can also target people's body parts (crotch and eyes included) with your attacks, which is very cool (see V.A.T.S. 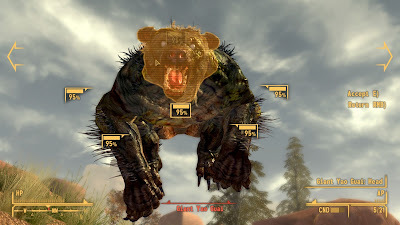 in Fallout 3) because you can force people to move slower, drop weapons, etc... Lastly, it has lots of references to pop culture, sci fi, Monty Python (like a "bridgekeeper who asks you three questions") in its random encounters. If you can get through the first hour of gameplay (character creation and plot introduction) you will likely be hooked for life... There's a game called Fallout 1 that many enjoyed but I never was able to get a working copy of. I'd still recommend for a die hard fan of the Fallout series because of the sheer volume of recommendations from my friends. 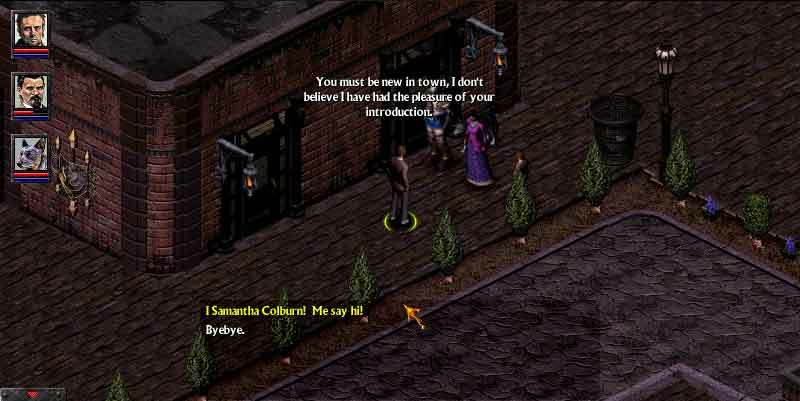 A super-sweet 3rd person RPG (isometric top-down view ala Diablo 2) with D2/Fallout 2 era graphics and minimal level grind requirements. Like with fallout 2 you can switch from turn based to real time game in the menu screen but where Fallout 2 focuses on specialty perks you have some incredibly diverse super powers at your disposal that dramatically affect gameplay. As far as fantasy games go four friends of mine (and many of the designers of Project Eternity) describe this as the best of its type. Period. I'm hard pressed to disagree. The only thing you might find frustrating is if you don't focus your hard-earned experience points on talents that boost your ability to "hit" things. 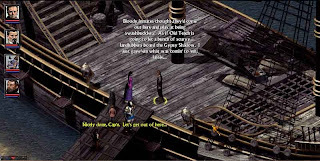 Aside on power-leveling in Arcanum: There's a place in the game early on where you can level up to the max level in about 20 minutes of level-grinding (It's called "Liam's cabin") so leveling in this game doesn't really have to be an issue if you find yourself getting overpowered regularly. I normally avoid this exploit though because it's generally not needed. Unique dialogue options for characters who were "raised by wolves"
You can disintegrate things (really, its awesome! 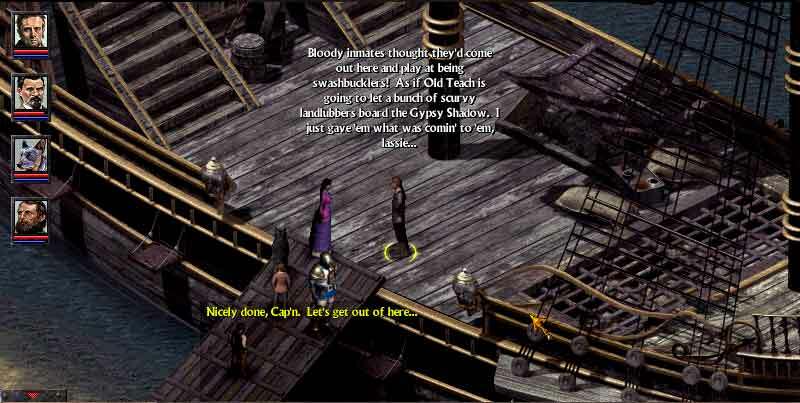 ), build/interact with dozens of deep party members (or not), bring the souls of the dead back from the abyss just to chat with them (and they have completely new/unique dialogue options because they are aware of being dead) and other things make this game truly a gem. Like with MASS EFFECT/Dragon Age it's very character interaction based (fallout 2 is like that as well), and the entire game's soundtrack is an amazing cello quintet by Ben Hogue, one of my all time favorite soundtracks in gaming. You will not be let down by this game... unless you build your character poorly in character creation and get eaten by wolves. 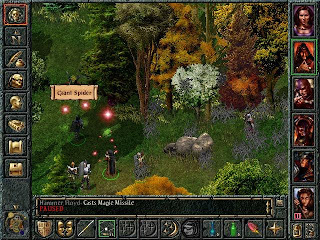 Universally accepted as the best pre-1999 traditional fantasy RPG by just about everyone, Baulder's Gate laid down much of the ground work for fallout 2 and Arcanum. As with its successors there are lots of social interactions, a turn based vs real time button, but instead of a steampunk or broken 1950's world Baulder's Gate focuses on the DnD world. It also uses the D&D 2.0 rule set and you can either build a team of people in multiplayer or seek companions you can regularly interact with, most of which are voiced (one of which has a magical hamster). This was one of the first games to allow you to truly affect affect your team and their views on the world (one of my favorite features in MASS EFFECT and Dragon Age) because the same company made all three games (sort of). Technically there's a minimal Level Grind in this series but it can be avoided by going through the "open ended world" in the order the game suggests. What's that mean? It means that when they tell you to go somewhere first, that's where your characters would be best suited going to (based on your level), so don't deviate too much on the world map unless you're looking for a real challenge early on in the game. 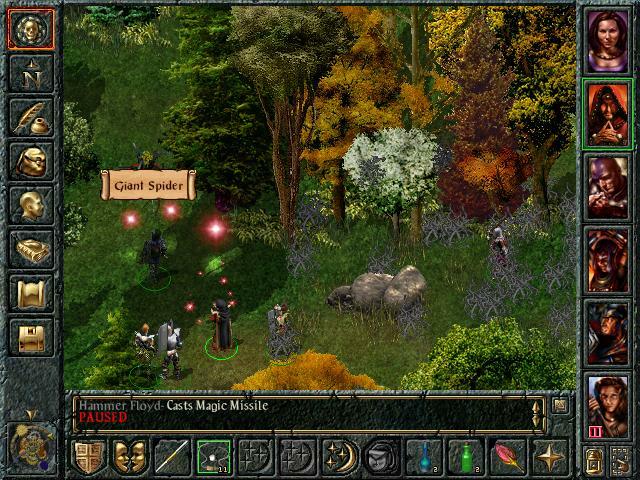 If graphics and gameplay have minimum standards for you to play a game, go to GOG.com and download the patch that upgrades BG 1 to the same graphics as BG 2 and merges the two games into a nonstop experience of awesome. You should probably just do that anyways because the plot from the first game and your saved game from the first game can carry over directly into 2, which starts at the very end of 1. Oh and be sure you save your files after BG2 because they also export to Icewindale and Never Winter Nights! 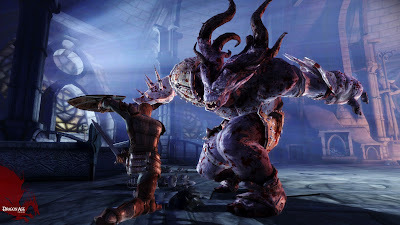 You play as a vampire in the VTM world (very dark) where the old testament God made Cain the first vampire and his grand children 23 times removed are vampires living in 1999. It's a "period piece" game set in 1999 (real time action rpg) where the bleak world is coming to an end and everyone is afraid of Y2K. 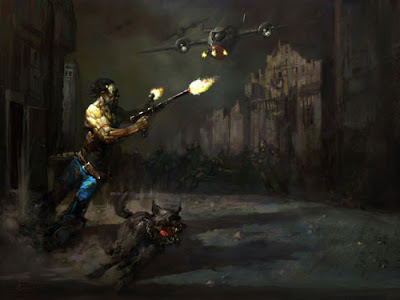 Your goal is to survive, not be noticed as a vampire in the human city of LA, and try to stop this world from ending while getting involved in lots of politics (blood feuds, vampire socialites vs anarchists, werewolves, demons, etc). 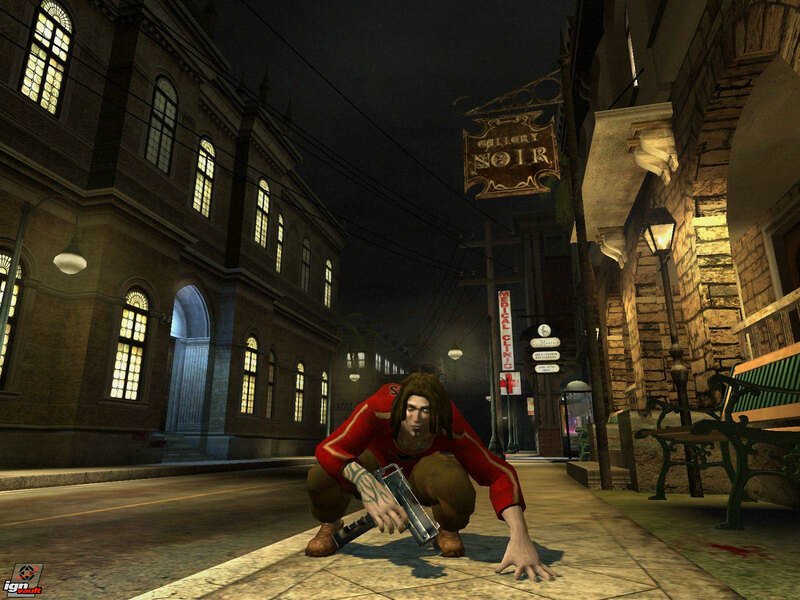 There's a fair amount of replay value here because your "breed" of vampire and dialogue options and play style but the game is more affected by your style of play. For instance, I was a crazy, well-intentioned, sooth-sayer vampire who wound up talking to stop signs (no, really), loved order (instead of anarchy), and was out to save the world from destruction (Note: I got the "cool" ending). There are also varying degrees of good and evil actions you can follow in the game that affect your character's morality. As far as level grind, you only put points into "talents" and there are 5 max points you can put into any talent, so in under 5 levels you can max out fighting and in 5 more you can max out health if you're concerned only with combat, which is real time. Speaking of which, I recommend using guns... a lot... A few fights towards the end of the game involve flying enemies or people with guns in long hallways... and I took hand to hand combat, regretting every moment of it... Anyway, it's a fantastically deep world, it's fully voiced, it's fun, and does a good job at being creepy and bleak without lapsing into what most would call emo. It's got a variety of locations from the city streets of LA, to run down tenements, to haunted houses, to beaches, to sewers, to the Danger Danger Gallery in Philly, er... I mean a Nosforatu lair. The music is also really worn and fitting. 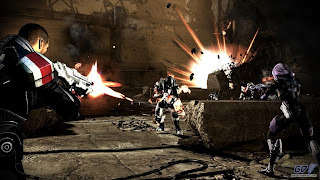 An action RPG FPS with super powers! In a distopian alternative 1960's themed game that questions capitalism, socialism, free will, and God you go to "Rapture", an underwater city free from the confines of taxes or morality, and try to survive as you're hunted by Splicers (those who have modified their genes so much that they've lost their frail grip on reality). Entirely unlike Bioshock Infinite it's survival horror. 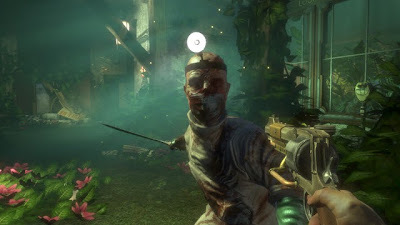 Most people would also agree that you should only play the sequel, Bioshock 2, if you don't mind following the same general model a second time, told through a slightly less powerful story. 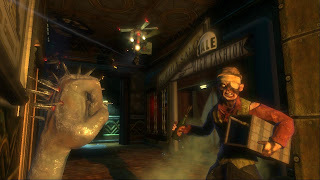 Bioshock is powerful, has a great story (which is hard to understand until halfway through the game but stick with it! ), and is a good example of a society without law. It's completely linear, there are no dialogue options, but I wasn't upset by this because it's got a lot of options as to how you play. 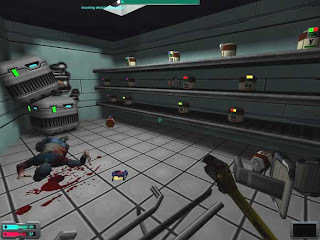 If you think of it as a more of a survival-horror FPS (very limited ammo) and less of an RPG it's very open. You can hack robots, shoot things, not shoot things, use only a crowbar to bash in the skulls of your enemies, or use ADAM, which is a form of superpower people can inject into themselves. Leveling also isn't important in this one so long as you tag skills fitting of your style of play. It's basically an HD remake of System Shock 2 with a new plot, set in 1960. Don't look this one up online though or you'll instantly bump into some massive spoilers. "I work for the road crew." "My red sign helps me work on the road." 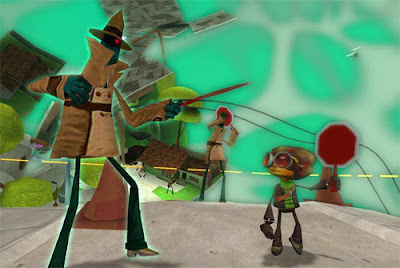 Technically more of an adventure/action game than an RPG, Psychonauts is one of the best kid-friendly stories I've ever played. It's surprisingly deep and remarkably fun. You play as a kid training to be a Psychonaut, a soldier who can enter the minds of the enemy, and you're at a sort of summer camp to become one. The gameplay revolves around you entering the minds of people and running amok in their imaginations. It's fully voiced, stylized, lots of fun, and completely strange. It almost feels like a mix of Hey Arnold (awkward kid-friendly social interactions), Invader Zim (same lead voice actor, lots of really weird moments), and maybe a Tim Burton film (in a very good way). There's a wide diversity of locations in the game (science labs, spooky castles, Tokyo) and it's (again) fully voiced with a top notch group of voice actors and great music. Just beware of the soul crushing difficulty spike at the final boss. It's the precursor to Bioshock, Dead Space, and Portal, all in one. Imagine a large dark ship where your only friend is a woman locked on the bridge of the ship. She's watching you through video cameras, telling you how to set things right, and make good your mutual escape through a busted intercom system. You both are opposed by the ship's AI, a humorless voice that basically tells you to sit tight and wait for your oxygen supply to run out. 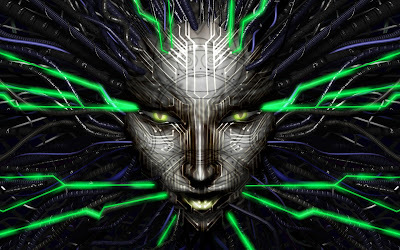 System Shock 2 is the very definition of a survival horror rpg/fps and just like Bioshock you can go full FPS, full stealth-crowbar-FPS, rely solely on your psychic super-powers, any mix of all of the above, and level up your skills appropriately. Lastly, I recommend a western game where you play as a gunslinger looking to redeem himself (as the title implies). Sure it's Grand Theft Auto with horses, but the setting is fantastic. You can dastardly tie women to train tracks, you can sell moonshine, you can be the lone ranger (it's actually more fun as the good guy). The story is one of the better ones in gaming. The gameplay is neigh flawless (though they certainly pit you up against a lot of enemies at times and you'll find yourself killing off entire populations of bandits), the voice acting is fantastic, and the soundtrack is really good. The true beauty I think you'll find though is in the setting. Bounty Hunting Side Quest: "Dead or Alive"
While you're going places, your "partner" or companions will chatter with you about "modern" politics: Things like "The gov't shouldn't be allowed to send a law man into our town and tell us how to run things" or "Ya' know some guy tried to get me to put my money into a FEDERAL bank?! I'd never trust such a thing" or other really deep moral, political, and philosophical thoughts of the day... Like women suffrage. Why do I classify this in a list of RPG's? Because it plays like one and has a deep plot akin to one, and when I want to play an RPG this game feels like it's in that category, though the main story is extremely linear. It's quaint, different, and grasps the deep setting well. At worst it's an amazing sandbox with a solid plot you can completely ignore with a really fun multiplayer mode. 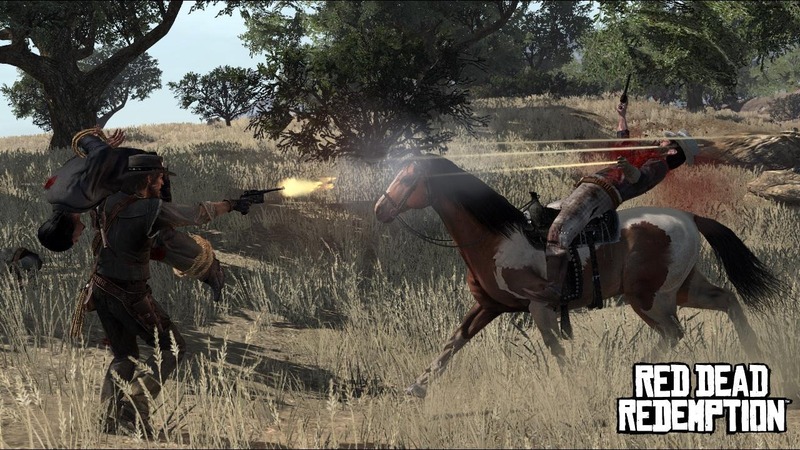 Last but not least, make sure you get the Red Dead Zombie expansion, which is included in the game of the year edition at no extra charge! So that's my list. They are all good depending on what mood you're in. 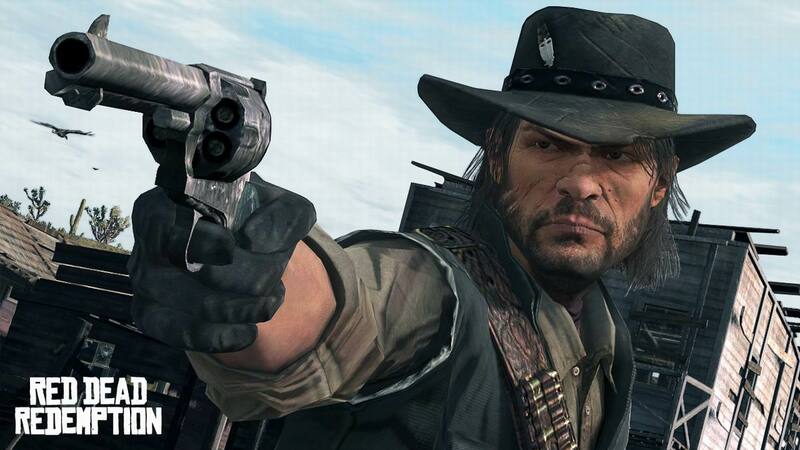 All of these games have massive spoilers so beware looking them up on things like wikipedia. I'd suggest the games' official sites or just outright buying them.